I am a big fan of Katie Fforde, her books never disappoint and they always leave you feeling pleasantly uplifted and her latest book A Country Escape is no exception. When Fran is contacted out of the blue by a distant relative Amy with news that she maybe inline to inherit the family farm in the Cotswolds she makes a big and brave decision to leave everything she knows and up stick to move to the farm to take on the challenge of looking after the farm for a year. What Fran didn’t realise was quite what a challenge she was taking in as the farm is run down and is not making a profit. Desperate to prove to Amy that she could not just cope but turn the farm around Fran gets stuck in to making some changes to the farm with the help of her best friend Issi and the herdsman Tig. Having been warned off the help of Antony from next door because of his interest in the farm Fran is cautious to accept any help from him. Just when Fran feels that things for the farm had turned a corner a surprise is around the corner that will put everything in jeopardy due to someone elses intentions for the farm. I haven’t found myself so immersed by a book in so long. From the moment I picked this book up I couldn’t put it down and so I ended up absorbing it in one sitting and now I am said to leave the characters behind. Fran was such a determined, hardworking and creative character who was so honest and caring, I warmed to her instantly. I really enjoyed her tackling each task head on desperate to come up with a way to save the farm and to show Amy that she was worthy of inheriting the farm and to prove that she had the best intentions of keeping the farm and its heritage in tack. The friendship between Issi and Fran was such a strong one their support for one and other was so believable and they bounced off each other perfectly. I was wary of Antony and I found my opinion of him gradually changing through out the storyline but was still on my guard waiting for something to come crashing around the corner and for his true colours to be shown. I really enjoy books that centre around building or saving small businesses so I knew this book was going to appeal to me but I love how much detail Katie Fforde went into in regards to the hurdles that need to be faced and the ideas that you bounce around to try and find that special something that just makes something work. It shows that nothing comes easy it is through pure determination and hard work that something becomes successful. To soften the business side of the book we also enjoy blossoming romances, friendships and gorgeous little puppies too! I think I should give the hardworking cows a mention too or I will not be in Tig’s good books! 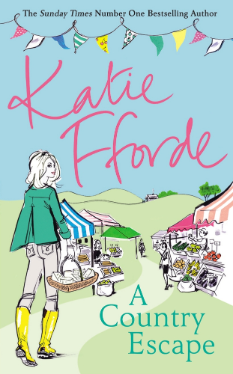 This was another wonderful read by Katie Fforde and it is definitely up there with my favourite of hers so fans will not be disappointed by thus book and anyone who is yet to discover Katie Fforde’s books this would be a great one to start with.